Walkthrough: After arriving in The Alola Region, your mother will suggest grabbing your things and doing a little exploring on your own. As you head around the corner from your new home will quickly see you on Route 1. As you continue down this path, you will ultimately come to a patch of wild grass. As you get near it, a Yungoos will come running out of said grass and attempt to attack you. However, quickly on the seen will be the three Alola Region Starters. 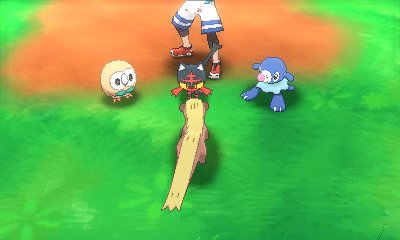 Outnumbered three to one, the Yungoos will flee back into the grass. Right around then, Professor Kukui will arrive and introduce himself formally in person. After he does, he will let you pick one of the three Starter Pokemon to journey throughout the region with. Your choice will be between Rowlet (Grass), Litten (Fire), and Popplio (Water); all will come at Level 5.